S. Lord, you promised your presence to those who gather in your name. Assist our Chapter delegates so that what they accomplish may be done in your name and may be for the good of the Order and of your Church. M. Lord, you animate your Church with the fire of the Holy Spirit and direct it with your light. Assist the members of our Chapter that they may discern your will and know how to transmit it to the brothers. T. Lord, you prayed to the Father that all might be one, as you and the Father are one. Grant that such unity may be achieved among the brothers assembled in the Chapter as a sign of the unity among all the brothers. W. You entrusted your Church to Peter and the apostles. Enlighten those who have the duty to elect the brothers who are to direct the life of the Order in your name. T. Lord Jesus, you called happy those who are poor and humble of heart. Enable us to recognize those who, in your name, will rightly reveal your plans for us. F. Kind Father, you enlighten and strengthen us with your Spirit. Help those who are assembled in your name in their task of rightly ordering and moving the life of our Order. S. Lord, you are present in the midst of those who gather in your name. Enlighten our brothers so that, in all their works, they may take into account the needs of the Order and of the Church. S. Lord, from of old you have communicated with us by means of the prophets. Grant that all those in the Chapter may be true prophets of your kingdom and that, faithful to your call, they may accomplish the mission you have entrusted to them. M. O God, you are the only foundation of our hope. Grant us a Prior General according to your heart, who will nourish in the brothers their hunger for you and will guide the Order in the fulfillment of your plans. T. Father, you govern us with love. Grant that those who are elected for the government of the Order may show to all the brothers the love with which you love us. W. Lord, you commanded Peter to care for his brothers. See that the superiors who are named in the Chapter be solicitous in the service of the brothers, zealous for the glory of the Father, and faithful to the promises of religious life. T. Lord, you promised your presence to those who gather in your name. Assist our Chapter delegates so that what they accomplish may be done in your name and may be for the good of the Order and of your Church. F. Lord, you animate your Church with the fire of the Holy Spirit and direct it with your light. Assist the members of our Chapter that they may discern your will and know how to transmit it to the brothers. S. Lord, you prayed to the Father that all might be one, as you and the Father are one. Grant that such unity may be achieved among the brothers assembled in the Chapter as a sign of the unity among all the brothers. paths both new and wonderful. for the forthcoming General Chapter. a personal life transfixed by your love. founded in Mercy toward our brothers. of passing on your Mercy. for all our hope is in your great Mercy. For almost three centuries, the Augustinian recollects identified themselves in the Church with this representation of St. Augustine. Today, August 28, the liturgical feast of the Saint of Hippo, once again we raise the old emblem and knit over it a brief reflection. The Augustinian recollects identified themselves with St. Augustine right from the start. And it could not be in any other way, proclaiming him by word and through plastic representations. Among these, the official seal of the Recollection occupies the highest place, which remained untouched for almost three centuries. On that seal they champion an Augustine kneeling before the Crucified Christ of normal size, portrayed as living Christ. The St. Augustine on the seal of the Order is barefooted and clothed as recollect. Portrayed also as bishop, but the episcopal ensigns –staff and miter are on the ground as if showing disregard of the honor and title as a bishop. It is clear that it wants to portray a concrete image of the Saint, as real saint. But the habit does not make a monk much less a saint. It is not the representation of Augustine that matters: being a bishop or not, neither a recollect nor Augustinian… just as in saying that renewal does not consist in knowing better the doctrine and life of our Father. These days we know about St. Augustine much better than our predecessors. And we have at our disposal countless and better instruments at the hour of looking for quotations and data. But it is not because of this that we say we are better Augustinian Recollects. What is more important in the representation of St. Augustine is the kneeling Augustine before the Crucified Christ. His gesture of adoration, his posture of contemplation and the bareness of everything else. In this lies the recollect originality, the newness of his inspiration. At the time of inception of the Recollection, towards the end of the 16th century, the Augustinian Order was in its moment of grandeur which sums up figures of great importance, monumental churches and monasteries, admirable evangelizing enterprises. But nothing of that sort is important as how the recollects would say. What matters are not the statistics, nor the structures, nor the works, of whatever kind they may be. The Recollection wants to reassert the radical experience of Augustine, depicted in this seal. The experience of the encounter with Christ. A personal and direct encounter with Christ, with a bare Christ nailed on the cross. This is what we call “prayer”, in all its true and deep sense of the word. “Knowledge and Love” of God; and the more in parishes, missions, schools, the better. But in as much and is always they are revitalized by prayer. Today, we are invited on it, on this day of St. Augustine. It is good that we know better our Father; that we show his doctrine the best way possible; that we educate augustinologists and spread everywhere the mind of the Saint. But an Augustinian Recollect will only be when, taking aside all the rest, daily cultivate the encounter and dialogue with the Lord and Glory of the Cross. Sacramento, Calif., Jul 15, 2016 / 12:02 pm (CNA/EWTN News).- On July 8 Pope Francis authorized the Congregation for the Causes of Saints to promulgate a decree recognizing the heroic virtues of Servant of God Alphonse Gallegos, who was auxiliary bishop of Sacramento from 1981 to 1991. The late bishop is now called Venerable, and only one miracle worked through his intercession is needed before he can be beatified. “This is wonderful news for all those who knew him,” Fr. Eliseo Gonzalez, vice-postulator of Venerable Gallegos' cause of canonization, told CNA. Fr. 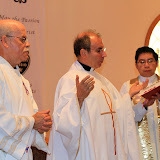 Gonzalez is a member of the Order of Augustinian Recollects, in which Bishop Gallegos was ordained a priest in 1958. Since the cause for canonization opened in December 2005, Fr. Gonzalez has been working to tell the bishop’s story. The bishop was born Feb. 20, 1931 in Albuquerque, New Mexico, and was the eighth of 11 children. His mother and father, Caciana and Joseph Gallegos, were very pious, according to testimonies collected for the canonization cause. The family prayed daily rosaries together and often had lessons on the catechism. In an effort to seek “better educational opportunities for their children as well as medical treatment for him,” Venerable Gallegos’ parents moved the family to Los Angeles in the early 1930s. Venerable Gallegos entered the Order of Augustinian Recollects as a novice in 1950. A year later, he professed his first vows, and his solemn vows three years later. “His visual handicap, however, limited his ability to read and to master all the study requirements for the advancement to the priesthood,” his biography explained. In 1954, Venerable Gallegos was moved to the order’s major seminary, Tagaste Monastery, in Suffern, New York. But his vision worsened, making his studies more difficult. He had great difficulty reading his breviary so he was given a dispensation to pray the rosary instead. “His situation was such that doubts were raised concerning his preparation for the priesthood,” but he was ordained a priest May 24, 1958, given his holiness, humility, and community spirit. Venerable Gallegos’ ministry as a priest began at Tagaste Monastery. He spent eight years working with the neighboring hospitals and religious communities. After, he was appointed novice master for the Augustinian Recollects' Province of St. Augustine in Kansas City, Kansas. In 1972, he returned home to be pastor at his home parish in Watts. The neighborhood was predominantly African-American and poor. Riots in the 1960s had left the area divided and filled with gangs, crime, and poverty. The priest made it his priority to focus on the local children, greeting them daily at the parish’s school. On the weekends, Venerable Gallegos would spend time with the lowriders of the community, blessing their cars and encouraging the Hispanic youth to pursue a college education. He also took care of the elderly and opened his home to anyone in need. He later served at Cristo Rey parish. Word spread of his service, and in 1979 Venerable Gallegos was appointed director of the newly-created Hispanic affairs office of the California Catholic Conference. In this role he worked with bishops in both northern Mexico and California on such issues as immigration and evangelization. His work there led to his appointment as auxiliary bishop of Sacramento in 1981. “He was Hispanic, yet he ministered to a very diverse group of people,” Olympia Nunez, Venerable Gallegos' long-time secretary, told CNA. Nunez said the bishop was incredibly kind and outgoing, and never complained about his disability. The bishop’s episcopal motto was “love one another.” He advocated for the culture of life, and personally paid Catholic school tuition for the poor. Fr. Gonzalez called Bishop Gallegos an inspiration and example of hope and fortitude for all. On Oct. 6, 1991, Bishop Gallegos and his driver were returning home from Gridley, about 60 miles north of Sacramento. They had car troubles, so the two got out and started pushing the car to the side of the road. Another vehicle, driving in the same direction, struck the bishop. More than 2,000 people were present at his funeral, and lowriders formed one of the longest funeral processions ever documented. In addition to his pastoral concern for the poor, Venerable Gallegos was known for his commitment to the culture of life. He had been at a gathering in Gridley to pray the rosary for an end to abortion the day he died. In order for him to be canonized, two miracles through the intercession of Venerable Alphonse Gallegos must be verified. The faithful are encouraged to visit Venerable Alphonse Gallegos’ body at Our Lady of Guadalupe Church in downtown Sacramento, his life-size statue in Bishop Gallegos Square, and a mini-museum displaying the bishop’s personal items in Oxnard, some 65 miles west of Los Angeles. BISHOP OSCAR SOLIS, Auxiliary Bishop of Los Angeles, made his first visit to Cristo Rey and administered the Sacrament of Confirmation to 31 teenagers and 29 adult members of our parish. (We have 41 teenagers and 37 adults in preparation for the Sacrament of Confirmation, which will be administered on May 14, 2016). Bishop Solis with the Recollect community at Confirmation. DEACON ASCENSION ESQUEDA accompanied the parish theatrical group, “Cristo Siempre” for their annual picnic on June 20 at Griffith Park. This is the 41st year in which this group has been active in the parish with three annual performances. FR. MICHAEL STECHMANN celebrated the Mass of Christian Burial on July 8 for Senaida Kane, sister of Bishop Alphonse Gallegos, at St. Cornelius Church in Long Beach. “Sena” was known by many members of our Province, and, growing up at San Miguel in Watts, our religious saw how she cared for all of the family members, especially a young Alfonso, and with their prompting, she began many years of catechetical service to the parish. She was the last surviving sibling of the Gallegos Family. ON JULY 26 our parishioners were afforded several opportunities to continue showing their generosity with the “Bundle Sunday,” sponsored by the St. Vincent de Paul Society, and participation in the Mission Cooperative Appeal of the Archdiocese of Los Angeles. Our parishioners filled the truck with usable clothing and household items. They were especially generous in responding to the appeal of Sister Sophia of the Daughters of Mary of Tanzania. We had coordinated with their contact person here in the United States, since she didn’t speak any Spanish, Deacon Ascension Esqueda assisted her with the mission appeal, and he communicated very clearly the details of their work and mission. She endeared herself to our parishioners, especially when she sang a song of blessing in Swahili, which was met with a thunderous applause at each Mass. There was an equally enthusiastic response from our people when she responded with the only Spanish word she learned: ¡Gracias! FR. MICHAEL STECHMANN went to Kansas for a week at the end of July to attend the 45th reunion of the graduating class of St. Joseph High School in Shawnee. There was a good representation of classmates present for the occasion, which began with the Saturday Vigil Mass in the parish church and a special remembrance for all of our deceased classmates. THE SUNDAYS OF AUGUST were occupied with registrations for Catechism/Confirmation classes. Mr. Jose Torres, Director of Religious Education, coordinated the process with the help of several family members. All of our volunteer catechists have returned for this year, and two sessions of classes are held six days each week. Fr. Michael hosted the meeting for the catechists on August 25, and we are especially fortunate that additional volunteers have responded to our invitation to assist in the program. Students from our Confirmation program and Youth Group have proven to be enthusiastic in their approach and delighted to have the opportunity to teach classes. The Opening Mass for catechism classes was held on September 12 and immediately afterwards the students and their families met briefly with their respective teachers. The Opening Mass for catechism classes. THE EXTERIOR OF THE CHURCH was painted during the month of August after repairs were made to the numerous cracks and fissures. The preparation, repair and painting went very smoothly and also included painting and repairs to the exterior of the parish hall and walls surrounding our property. CRISTO REY HOSTED a fingerprinting session on August 22 as part of the Safeguard the Children program of the Archdiocese of Los Angeles. There was a tremendous response from our community and surrounding parishes, and three live-scan machines were operating continuously for seven hours. (The only downside was the weeks of telephone calls for persons registering and inquiring about the process and scheduling appointments). FR. MICHAEL STECHMANN has been invited to participate in the Good Leaders/Good Shepherds program that will meet six times during 2015/2016. He, along with 28 priests from the Archdiocese of Los Angeles and the Diocese of Orange, have received scholarships for this through the generosity of the Hilton and Leavey Foundations. A TRIDUUM in preparation for the Feast of St. Ezekiel Moreno was held in the parish, and, following the Mass on the evening of August 1, Fr. Juan Jose Guzman administered the Anointing of the Sick. Deacon Ascension Esqueda assisted and presented the relic of St. Ezekiel for veneration. Many parishioners are imploring the intercession of St. Ezekiel for family members with serious health concerns. THE SECULAR AUGUSTINIAN RECOLLECTS, under the director of Fr. Juan Jose Guzman, continue to meet regularly for Evening Prayer and Mass, followed by a conference and social. For the Solemnity of St. Augustine they gathered in the parish hall to view a recent video on his life, interspersed with quotations from his Confessions. AN APPRECIATION DINNER for parish volunteers was held in our parish hall on Sunday, September 27, with the local community hosting the event. More than 100 catechists, choir members, lectors, ushers, Eucharistic Ministers and other volunteers joined us for a festive meal of Italian fare and entertainment. The surprise gift from our community to the parish volunteers was the presence of Bryan Muñoz, a 13 year-old mariachi singer who had been present at the parish festival in May. The community with Bryan Muñoz. Parish volunteers enjoy the dinner and entertainment during the Appreciation Dinner. THE LONG-AWAITED ANNOUNCEMENT of the appointment of three new auxiliary bishops for the Archdiocese of Los Angeles was met with great enthusiasm. On September 7, Frs. Michael Stechmann and Juan Jose Guzman attended Vespers on the eve of the episcopal ordination of Bishops Robert Barron, Joseph Brennan and David O’Connell and also participated in the ordination at the Cathedral of Our Lady of the Angels on the following day. Fr. Michael attended the Mass of Installation for Bishop Brennan on December 19, which was held in North Hollywood. Fr. Michael, Bishop Brennan, and Fr. Juan José at the cathedral. THE MONTH OF NOVEMBER was especially busy with meetings and Frs. Michael and Juan Jose continuing to assist at hospitals and nearby parishes. Cristo Rey hosted the regional deanery meeting for priests on November 13, and the following week we organized the prayers at San Fernando Mission for our deceased religious, followed by lunch at the parish. In the midst of all of this we were in the novena in preparation for the Solemnity of Christ the King, with several families participating in the nightly presentation of flowers and different individuals leading the novena meditations, and the homily for each of the evenings was on a rotating schedule among the three of us. The feast of Cristo Rey was observed with great enthusiasm on November 22 with the traditional street procession accompanied by the Banda “Nueva Ilusión” and a very successful parish festival. CRISTO REY hosted a meeting of representatives from other parishes in preparation for the 2016 Archbishop’s Appeal, “Together in Mission,” which will begin in January. The theme for this year is “Though we are many, we are one.” Another training session was held here for those who have volunteered to speak at neighboring parishes. Mr. Anthony Sciacca, Director of Archdiocesan Appeal, recognized Fr. Michael Stechmann and the Cristo Rey community for their continued generosity for the annual campaign. ACTIVITIES DURING DECEMBER include the novena in preparation for the Feast of Our Lady of Guadalupe, with enthusiastic participation each evening for the Mass, presentation of flowers, homilies specific to the feast and parishioners leading the novena prayers. Each night of the novena was especially well attended and spirited because of the varied selection of hymns by the choirs each evening. The celebrations on the feast began at 4:30am with the serenade to Our Lady by the Banda “Nueva Ilusión” prior to the 5:00am Mañanitas and Mass. The Guadalupanas of the parish in their customary generosity gifted the parish with the mariachi for the Mass and entertainment in the parish hall afterwards, along with tamales, pan dulce and champurrado for everyone present. LAS POSADAS celebrations began on December 15 and continued nightly after the 7:00pm Mass. Deacon Ascension Esqueda took responsibility for the procession, arranging the choral singing, and leading prayers in the parish hall before the festivities. Parish groups and individual families were very generous in volunteering to host the celebration for the nine days of ample refreshments and providing several piñatas each night and “take home goodies” for the children. Every evening had a different spirit and enthusiasm because of the sponsors. The parishioners were especially delighted with the “baile folklórico” dances. Dancers during the Las Posadas celebration.